Whether you enjoy an activity filled vacation or a laid back family get-a-way, you will love this Maui vacation rental. With its sprawling 11 acres of pools, Jacuzzi's, Koi ponds, gardens, tennis courts, putting greens and incredible ocean view & oceanfront condos, this resort is a vacationer’s dream. Choose between one, two or three bedroom Maui condo rentals with a full kitchen and lanai, perfect for watching the tropical Hawaiian sunsets. $17/day facility use fee (10 day/$170 max) will be charged at check out. Remodeled with ocean front views on the ground floor in North Kaanapali Sleeping accommodations will allow for a maximum of two people only. A window air conditioner in the living room cools the entire condo. The bathroom features a walk-in shower, no tub. An in-room safe keeps your valuables secure. Bring your laptop and enjoy free DSL internet access. *Property Spalling Project thru Nov 2014 Phone our office for details. Remodeled with ocean views in North Kaanapali. The bathroom features a walk-in shower, no tub. Wake up in the morning to the sound of the ocean. Bring your laptop and enjoy free property wide wireless internet access. A split system air conditioner will keep you cool in either the living room or the bedroom. $1/phone call will apply to all calls. Four people maximum occupancy. 2nd floor corner unit with AMAZING ocean front views! Smell and hear the sound of the ocean from our condo. It does not get better than this! As of Aug 2017** Newly remodeled unit with new kitchen, bathroom, living room, custom built-in cabinetry and furnishings we like to call "Beach Chic. Occupancy for up to four people with a queen bed in the bedroom with a Tempurpedic mattress topper and a queen sofa sleeper in the living room. Wi-Fi and local calls in condo. The Papakea Beach Resort is located on North Kaanapali Beach and offers two pools (one is heated), two Jacuzzis, pool cabanas, gas bbq's, shuffle board, tennis courts, putting greens and koi ponds. Incredible ocean views overlooking the pool and lush gardens from this studio in North Kaanapali. Enjoy this quiet studio as your own personal retreat after a day at the beach and watch sunset from your private lanai. A window air conditioner cools the entire condo. Bring your laptop and enjoy free property wide wireless internet access. $1/phone call will apply to all calls. Two guests maximum please. Remodeled with ocean views in North Kaanapali. A 6 night minimum stay is required. A window air conditioner in the living room cools the entire condo. The bathroom features a walk-in shower, no tub. Bring your laptop and enjoy free property wide wireless internet access. $1/phone call will apply to all calls. Two people maximum occupancy. Remodeled with ocean views in North Kaanapali. This condo features 2 bedrooms with bathrooms downstairs plus a loft bedroom with its own bathroom. The twin beds are located in the loft bedroom. Sleeping accommodations will allow for a maximum of six people only. In addition to the plasma TV in the living room there is also a TV and DVD player in the master bedroom. All 3 bathrooms feature walk-in showers, no tubs. Bring your laptop and enjoy free property wide wireless internet access. An in-room safe keeps your valuables secure. $1/phone call will apply to all calls. Deluxe, remodeled with ocean views in North Ka'anapali. This condo features 2 bedrooms with bathrooms downstairs plus a loft bedroom with its own bathroom. Sleeping accommodations will allow for a maximum of six people only. In addition to the flat screen and premium sound system in the living room, there are TV’s in all the bedrooms. A Split A/C system and ceiling fans help keep the condo cool. All 3 bathrooms feature walk-in showers, no tubs. To increase living space a dining room table has been replaced with seating for six on the lanai. Wake up in the morning to the sound of the ocean or a view of the outer islands. Bring your computer equipment and enjoy free wireless internet access in our condo. Ocean views in North Ka'anapali. This 4th floor condo features 2 bedrooms with bathrooms downstairs plus a loft bedroom, with 2 twins beds, and a half bathroom. The living room has a 37" LCD HDTV & Blu-ray player with property HD signal to match. The master bedroom has a regular 27" TV with standard channels. Queen size sofa sleeper and carpet new as of Oct '16. Full size washer and dryer is also provided. Bring your computer equipment and enjoy free wireless internet access in our condo. Resort features 2 pools, cabanas, tennis courts, putting greens, shuffleboard and plenty of gas BBQ's in the pool area to grill up the fresh catch of the day. This 1 bedroom, 1 bath Deluxe Remodeled 2nd floor ocean view vacation condo at the beautiful Papakea Beach Resort in North Kaanapali is located in building E on the North side of this 11 acre beach front complex. This vacation rental features high-end tropical furnishings, tile floors throughout, remodeled kitchen and bathroom with granite counters and beautiful wood cabinetry. Bathroom features a tiled walk-in shower with bench and handrail (no tub). Bedroom features a king bed plus a queen size sofa sleeper in the living room for a maximum occupancy of 4. A split air conditioning system cools the entire condo plus ceiling fans are featured both the living room and bedroom for maximum comfort. Flat screen TV's in both living room and bedroom. Remodeled with ocean views in North Ka'anapali. Tile throughout except bedroom, gives this condo a clean finished look. Ceiling fans and a window air conditioner in the living room helps keep the condo cool. Wake up in the morning to the sound of the ocean. The bathroom features a tiled and glass walk-in shower, no tub. Bring your computer equipment and enjoy free wireless internet access in our condo. Resort features 2 pools, cabanas, tennis courts, putting greens, shuffleboard and plenty of gas BBQ's in the pool area to grill up the fresh catch of the day. Ground floor one bedroom condo with direct ocean front views from the F building at the Papakea Beach Resort in beautiful N. Kaanapali. Remodeled and tastefully furnished this Maui vacation rental is the perfect choice for couples traveling together or a family of 4 with a king bed in the bedroom plus a queen sofa sleeper in the living room. Tile floors in the living room and kitchen with carpet in the bedroom. Beautiful kitchen with granite counters and custom cabinetry has everything you need to make a home cooked meal. Condo features a window AC in living room with ceiling fans in both the living room and bedroom. Wi-Fi and parking are included in the $17 per day facility fee*. Ocean views in North Ka'anapali. Split air conditioning, units in living room, master bedroom and loft. This condo features a down stairs master bedroom and bathroom. The loft bedroom with the queen and twin bed, has its own bathroom. Both bathrooms feature stall showers, no tubs. In addition to the flat screen TV, BluRay Player and Bose wave radio in the living room there is also a flat screen TV in the master bedroom and loft. Bring your laptop and enjoy free property wide wireless internet access. $1/phone call will apply to all calls. Remodeled with a partial ocean view our 2 bedroom is located on the ground floor in North Ka'anapali with easy access to pools and beach. Under new ownership as of March 2016 and owner has already completed the following updates: New microwave and dishwasher, new tile on lanai, living room and kitchen, plus new lanai furniture. Check back soon for updated photos! The lanai walks directly out to the putting green and koi pond. See the ocean as you walk out to the manicured lawns. Ceiling fans and a window air conditioner in the living room help keep the condo cool. This condo features both bedrooms on one floor. Listen to your own music library on the iPod docking station provided. Enjoy a relaxing evening and watch flat screen TV in the living room or master bedroom. Bring your computer equipment and enjoy free wireless internet access in our condo. Beach gear has been provided by the owner, so snorkel, surf and play as you wish. This lovely 2 bedroom, 2 bath condo has been updated with fresh paint, new carpet and kitchen appliances. To maximize cooling and ventilation, we have installed new cutting edge, tinted, duo-pane, Low E windows throughout the condo. For additional comfort, each room has ceiling fans and louvered windows so you can enjoy the Maui breeze (No A/C in this condo). This condo features the master bedroom facing the ocean side which features TV and a safe to protect your belongings. The second bedroom is in the back of the condo giving each guest a lot of privacy. From the lanai, enjoy overlooking the putting greens, koi ponds, pool and ocean. Ocean views from our 3rd floor 1 bedroom vacation rental in the "G" Building at the beautiful Papakea Beach Resort on N. Kaanapali Beach. Resort features 2 pools, jacuzzi's, shuffle board, putting greens and tennis courts. Our vacation rental features a flat screen TV with DVD player in the living room and free Wi-Fi access. Bathroom features a tiled shower (no tub). Private bedroom with a queen size bed. Ceiling fans and a window air conditioner in the living room helps keep the condo cool. Ocean views from this 4th floor corner unit in North Ka'anapali. A mini 'facelift' as of Apr 2011: new carpet, paint, 37" flat screen TV & DVD player in the living room & 20" flat screen in the loft, ceiling fans, lighting and accessories. Ceiling fans and a window air conditioner in the living room helps keep the condo cool. This condo features a down stairs master bedroom and bathroom. The loft bedroom upstairs has its own 3/4 bathroom. See the ocean from your lanai. Bring your computer equipment and enjoy free wireless internet access in our condo. This charming 2 bedroom Papakea condominium is located in "H" building near ponds and gardens. Great views from the beach and off to the neighbor islands of Lanai and Molokai. Tastefully decorated with Hawaiian fusion decor. Remodeled kitchen and bath. King bed in master bedroom, 2 queen beds in guest bedroom + queen sofa sleeper in living room. 6 guests maximum occupancy-no exceptions. Ceiling fans and a window air conditioner in the living room helps keep the condo cool. The Papakea Beach Resort is located on the Kaanapali coast of Maui. It has 13 acres of lush tropical gardens with foot bridges and Koi ponds. The Papakea Resort has 2 pools and hot tubs. Excellent location, with fantastic panoramic views of ocean, koi ponds, putting green, lush gardens and pool on North Ka'anapali Beach! Tiki torches light up the lush gardens each evening. Updated with new carpet, paint, window coverings and flat screen TV’s in the living room and master bedroom. Blu-ray DVD player and iphone/ipod/CD player in living room. The 2 bedrooms & 2 bathrooms are all on one floor. Wake to the sounds and sights of the ocean. Ceiling fans and a window air conditioner in the living room helps keep the condo cool. Bring your computer equipment and enjoy free wireless internet access in our condo. Full service front desk privileges apply to all rentals in this condo. Conveniently located ground floor in the K building, with fantastic panoramic views of ocean, Koi ponds, putting green, lush gardens and pool on North Ka'anapali Beach! Updated, Summer 2011, including iPod docking station, decorative linens and accessories as well as refreshed kitchen supplies and appliances. The 2 bedrooms & 2 bathrooms are all on one floor. Wake to the sounds and sights of the ocean. Air conditioned unit along with washer and dryer. Bring your laptop and enjoy free property wide wireless internet access. $1/phone call will apply to all calls. ​Whether you enjoy an activity filled vacation or a laid back family get-a-way, you will love this Maui vacation rental. With its sprawling 11 acres of pools, Jacuzzi's, Koi ponds, gardens, tennis courts, putting greens and incredible ocean view & oceanfront condos, this resort is a vacationer’s dream. 2nd floor remodeled vacation condo with wonderful ocean views in North Kaanapali. This condo features both bedrooms all on one floor. Brand new sofa sleeper as of Mar '17. Listen to CD's and watch your DVD's with the 5 disc CD changer in the living room. Enjoy a relaxing evening and watch TV in the master bedroom as well. The guest bathroom features a stall shower, no tub. Ceiling fans and a window air conditioner in the living room helps keep the condo cool. Condo features a full size washer and dryer. Bring your electronic equipment and enjoy free wireless internet access in our condo. Resort features 2 pools, shuffleboard, tennis courts, putting greens and plenty of gas BBQ's in the pool area to grill up the fresh catch of the day. Breathtaking ocean views overlooking the south pool and cabana. 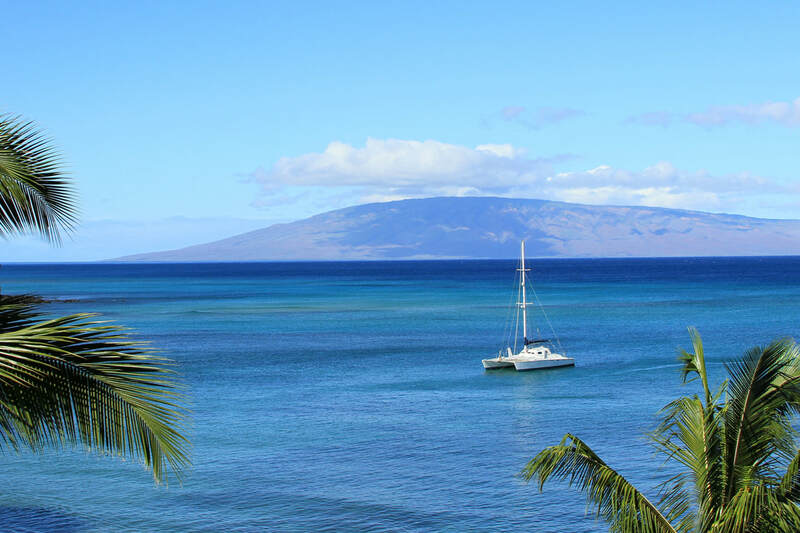 Building K is just moments walk out to North Ka'anapali's crystal blue waters. Walk to nearby fish markets, grocery stores, farmers markets and eateries. Sunsets, mai tai's and whales beckon year-round use of the spacious lanai. In addition to the flat screen TV in the living room there is also a TV in the bedroom. A window air conditioner in the living room cools the entire condo. Bring your laptop and enjoy free property wide wireless internet access.